The browser based game, Saga, Crushed was his recent entry for this past January’s Global Game Jam and Candy Jam. As part of the 2014 Global Game Jam’s theme of “we don’t see things as they are, we see them as we are”, it was created from beginning to end across three days and inside the span of 48 hours. Meanwhile, as part of Candy Jam it was entered among a larger game development community protest against the considered abusive trademark practices recently performed by the game development company King. Reminiscent of the mythological Sisyphus’ punishment, the player compels themselves to push a candy boulder up a mountain to no defined end. Doing so requires the use of only two buttons; the up arrow to “heave” and the spacebar to “ho” or prepare. Yet before each single “heave” the player must “ho” at a rate of n+1 times to succeed with each push of the boulder. But, should the player undercount or even overcount their bracing before the push, their candy boulder will fall back down to the foot of the mountain where they must begin once more. “Heave. Ho, heave. Ho, ho, heave…” is how you’re introduced to the game’s mechanics whereby your instructions then disappear from above the grid playfield and you’re left to keep track of the “ho” count on your own. At times, replacing your instructions will be procedurally generated sentence fragments such as “without a hat,” “small mosquitoes,” and “my burden falls, I follow,” that attempt to imitate haiku-like verses to aid in the player’s contemplation of their task, but can also be a distraction in either their appearance or sounding nonsensical in their arrangement. Accompanying the haiku-ish lines is the background music of one droning full note followed by another in a tone vaguely reminiscent of some traditional East Asian musical compositions. Along with it are two lower beats that sound off whenever the player presses the spacebar, and according to the game’s creator are to be interpreted as footsteps. 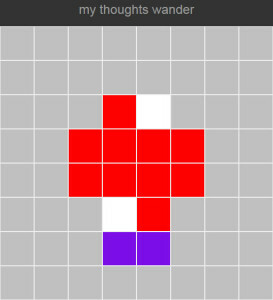 Continuing it’s sparsely designed theme, whether by intent or time constraints, the game’s art can be considered abstract in style as it takes place inside an 8×8 grid with a set of red blocks arranged to resemble the portrait view of a person atop a couple of purple blocks that one can assume are footprints. 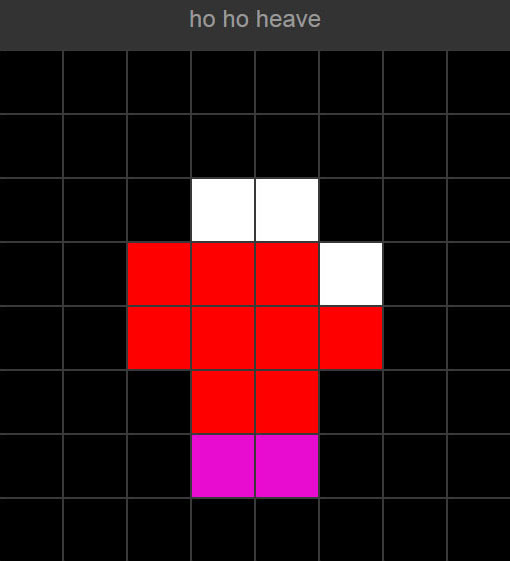 About the character’s body is a random arrangement of white blocks that is presumably the candy boulder while the rest of the grid space is a slow-pulsing black-to-grey background representing the mountain. In fulfilling its intended roles as entries for two game jams under their respective themes, Kevin Harris’ Saga, Crushed has accomplished such without fail. It may even be a contemplative game as intended, not just in direction but in also the scope of cutting away—either by design or time constraints—so much of what so many players are accustomed to in their games. Stats, displays, multiple buttons and button functions, explicit representational designs, and full musical arrangements can all be considered superfluous to the task actually given a player. There is no point system to tally your efforts, no tracking of how many “ho’s” before your single “heave,” no clear representation of your avatar or its environment—just an abstract visual and audial canvas the player’s mind adjusts to or creates whatever it chooses to compensate for the sparse presentation as they reenact Sisyphus’ eternal task. Yet even after understanding more behind the game’s development from Kevin’s postmortem, it can be difficult to find that contemplative quality Saga, Crushed is seeking to evoke, and any indication why is debatable. That inability for a player to adapt themselves to the game’s intention may be on account of its extreme abstractness, the lack of multiple readouts and loadouts players are accustomed to in many of their games, the lax and lugubrious pacing, the narrow focus with a singular task, or even the offer of a meditative state as opposed the player creating one within the game’s environment. But much like the Global Game Jam 2014 theme of “we don’t see things as they are, we see them as we are,” a player could be just as unwilling to accept that Saga, Crushed has so easily given them a clear, single task and path to contemplation when they are so endeared to normally eking out such from their games. This is but one of many games created during the Lawton Global Game Jam. There are many more to be played both online and off. We will write up reviews of the others soon.